Nikita Singh is the author of the book Love@Facebook and Accidentally In Love. After pursuing a degree in Pharmacy, she decided to try her hand in writing. Durjoy Datta is an engineer, and also has a management degree. He is the author of several books like Of Course I Love You and She Broke Up, I didn’t. This is the authors’ second collaboration after the novel If It’s Not Forever. The novel is about a girl, Niharika who’s an introvert and a self-opined geek. She’s the plain girl with no interest to dress attractively, or date, she’s more into her academics… you could say she’s an exaggerated version of a first-bencher, with those thick glasses and eager to live up to people’s expectations. She’s had her heart broken early, and isn’t looking to repeat that experience and the repurcussions of it. She gets into a top college away from her hometown, is called to Delhi by her sister (who’s that perfect girl, according to her) and she returns a changed person. She loses the glasses, begins to wear attractive dresses than old “rotten jeans” and well, changes into a girl. The once non-shopping girl then nearly gets into an accident when she comes out from shopping (strange, isn’t it?) and kind of falls in love with the guy who nearly hit her. She begins believing in relationships again when voila, she finds out they guy has a past that makes it personal for her. So dumping him immediately, she heads off to college. After that, it’s like a college story. 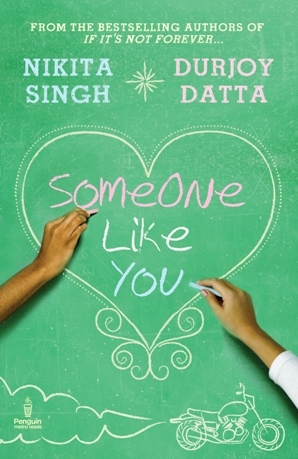 She finds a best friend Tanmay, who defends her against the college senior “bully”. He’s that introvert type like her too, and when she finds that Pia, her roommate is a rich, kind-of spoiled brat, she tries to set up the two of them up. When they seem to jump into trouble, a senior seems to come to their rescue. Meanwhile, the old boyfriend Akshat tries to win her back, and she finds herself attracted in a way to the senior guy. It’s like a roller coaster of her relationships. In between, a tragedy is thrown in that we kind of begin to expect as well. It’s a light read. That’s the thing I liked the most. You can read it quickly, like if you are having some time traveling back in the office cab or college bus perhaps. The plot and narration is simple, as is the English. It’s romantic but not to the point of being mushy or sickly sweet. The events seem understandable in the order, though sudden at times. And the cover design is quite simple as well. It seems filmy. Literally. I know we as authors are influenced by other authors and movies, but I could see some scenes right out of movies, and a line or two that’s quite similar to the dialogue in them. I didn’t like that part. There is nothing very “new” in the plot, we know or probably expect what will happen at the end. It’s a one-time read for me. Neither very excellent, nor close to mediocre. A light read that’s enjoyable. The transition usually is from pretty salwar to 'rotten' jeans no?! Why did I not know about the existence of this other blog! Personally felt that it was one of the most boring books that i have read in this format and segment. It had nothing to offer, was too predictable, repetitive and substance-less. Possibly, Pulkit. But it kept me from falling asleep on the journey back from office. So made me fee it wasn't that bad a book. Predictable.. yes, I didn't like that part and I've mentioned it. :) And maybe its coz I haven't read a Durjoy book too. I ma surprised that books with sloppy writing, poor grammar and poorly thought plots get published so easily. but then, standards of reading in general are poor.